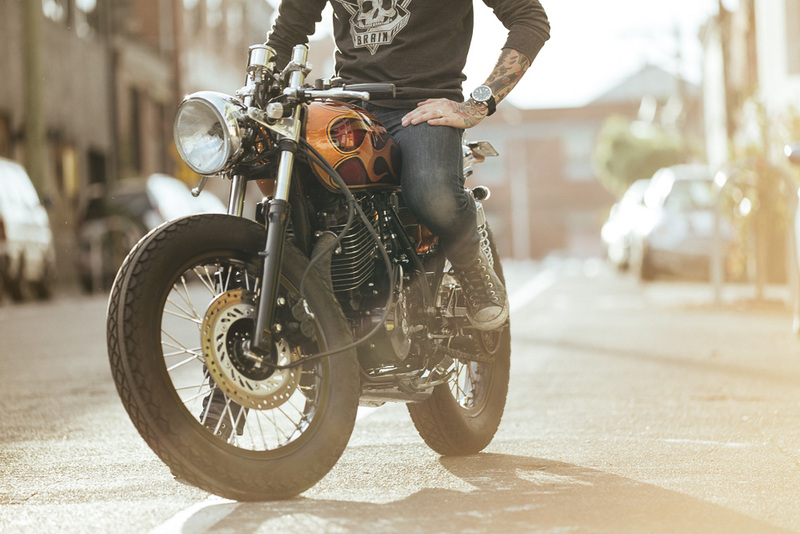 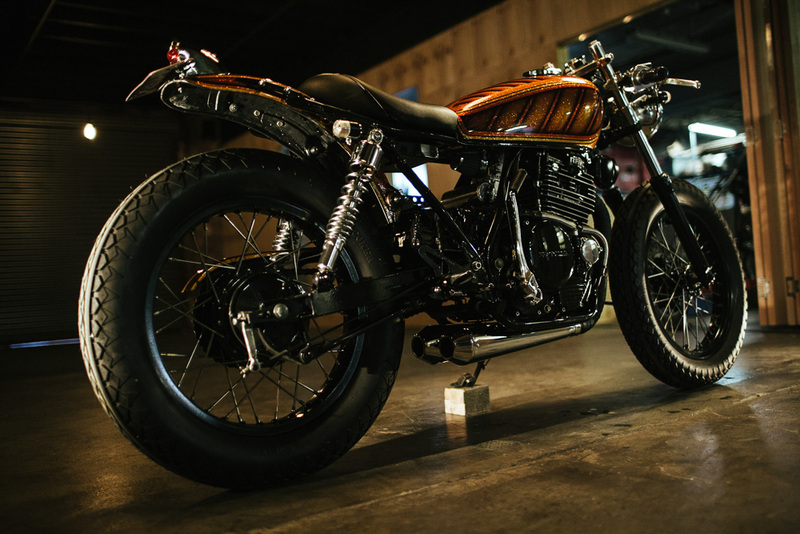 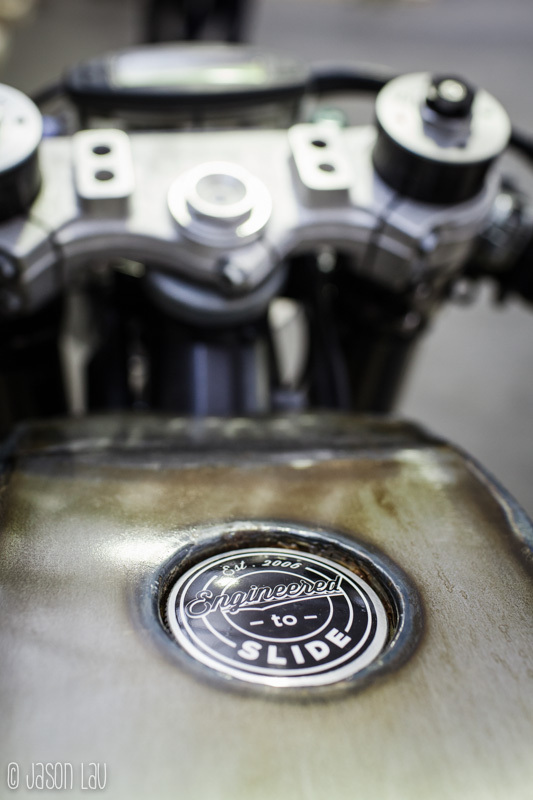 I had the privilege of photographing this exquisite cafe racer belonging to Jimmy Goode of Kustom Kommune. 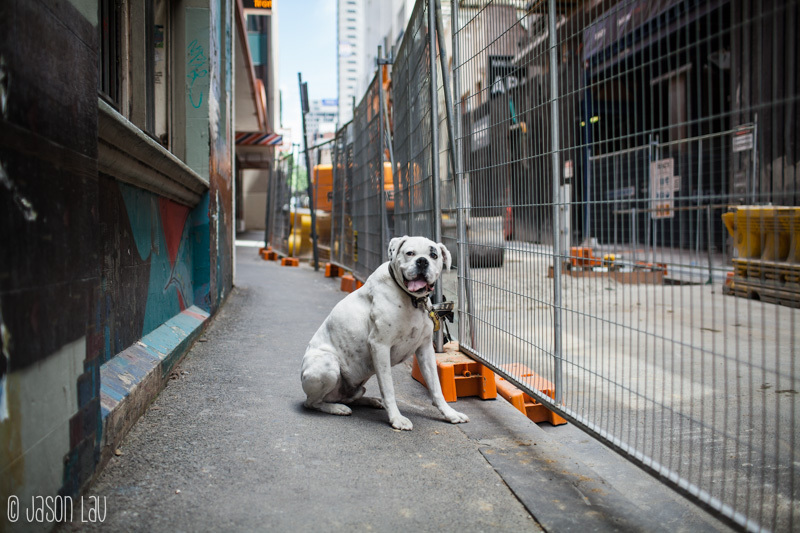 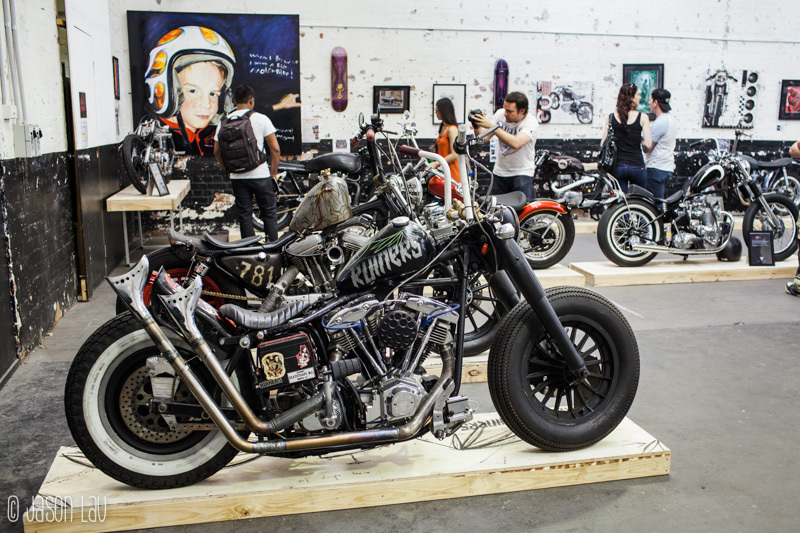 Kustom Kommune is an independent community workshop located in Collingwood, Victoria, Australia. 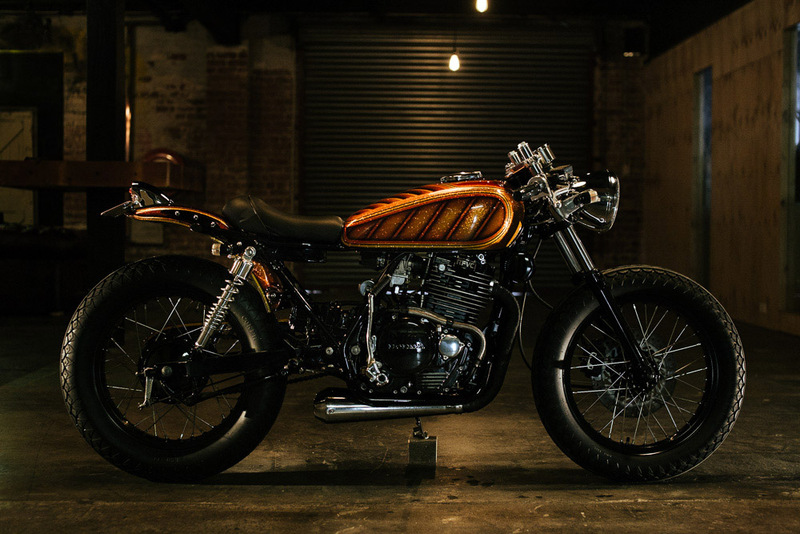 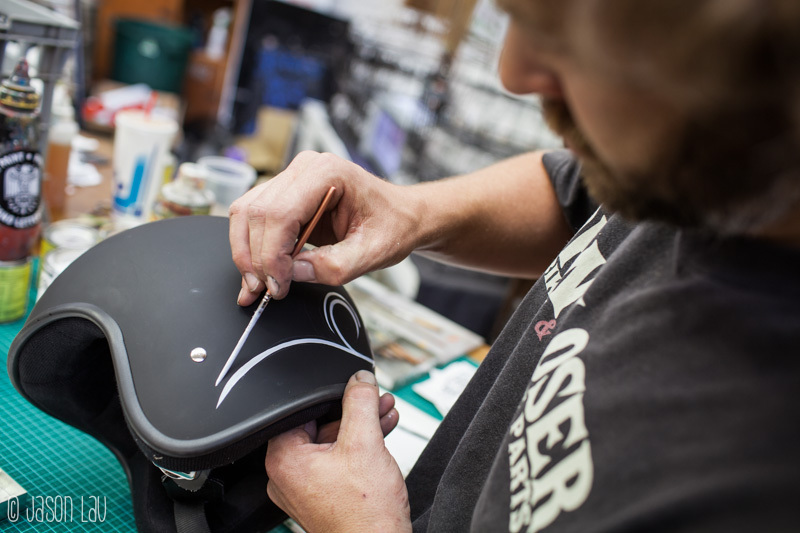 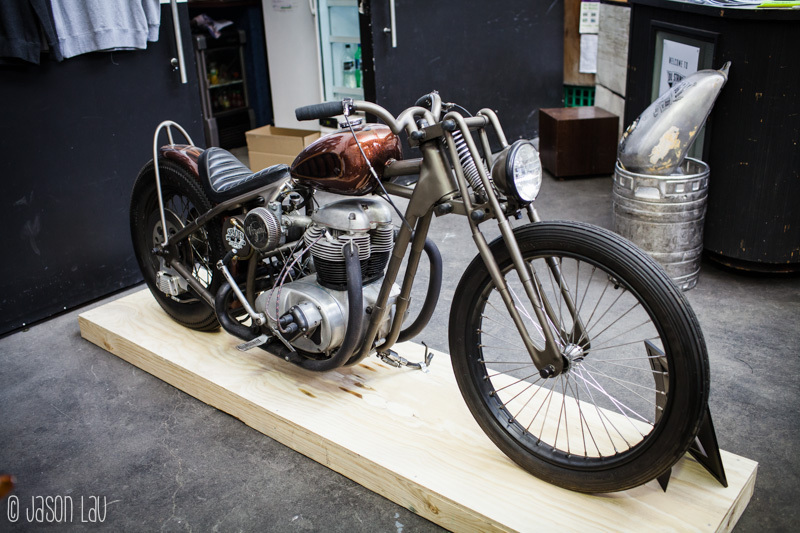 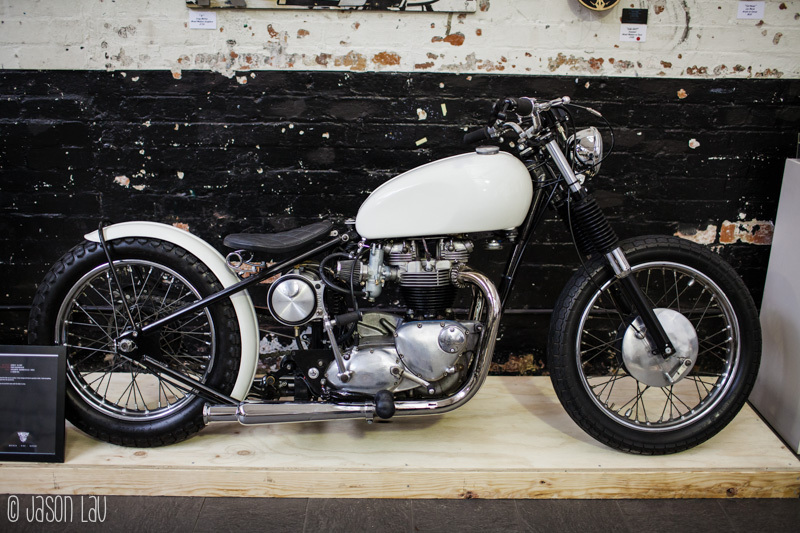 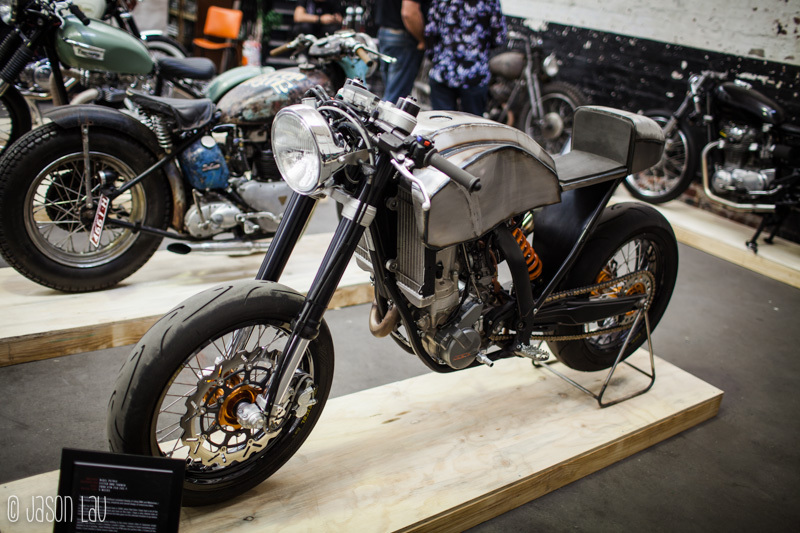 It is a dream project headed up by Jimmy and Geoff Baldwin (Return of the Cafe Racers blog). 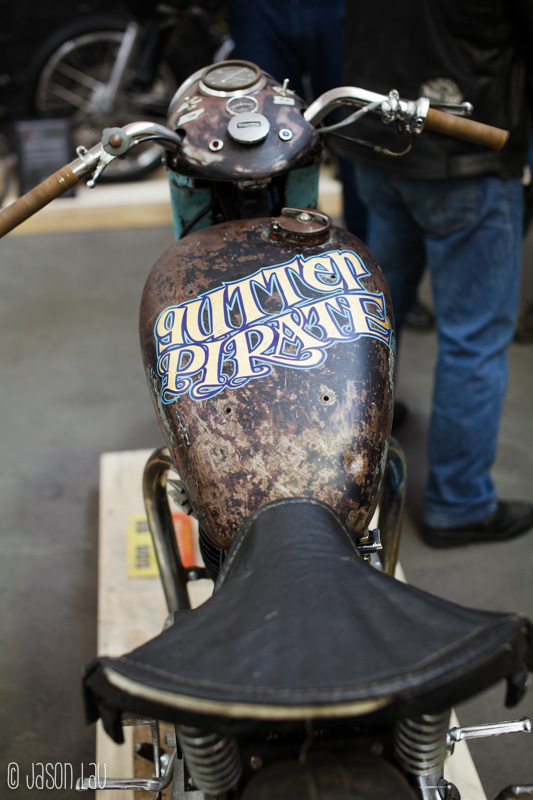 They are also responsible for putting on the Oil Stained Brain custom bike show. 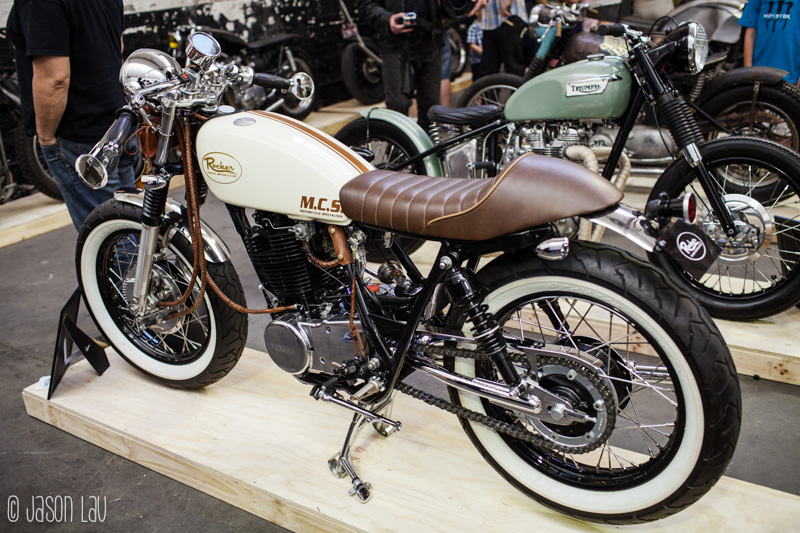 This Honda GB400 SL was certainly a highlight of that show. 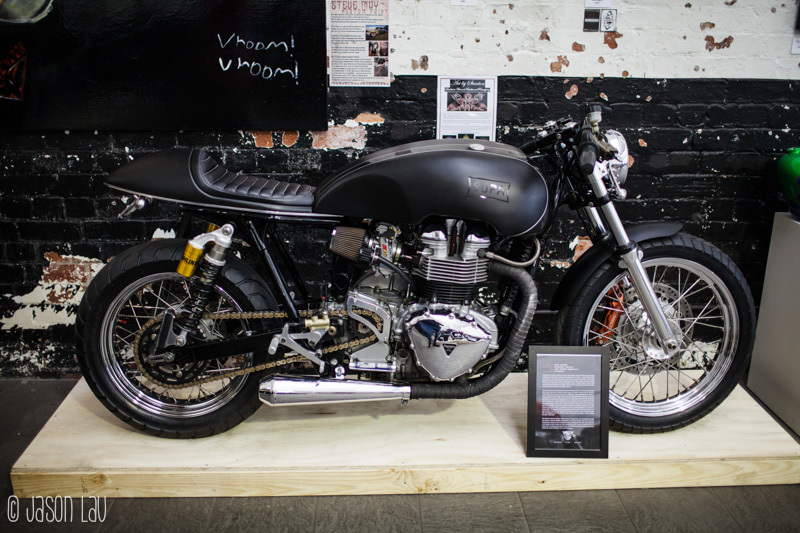 It has been massively customised by Raider Motorsport, bored out and makes the most beautiful noise when running. 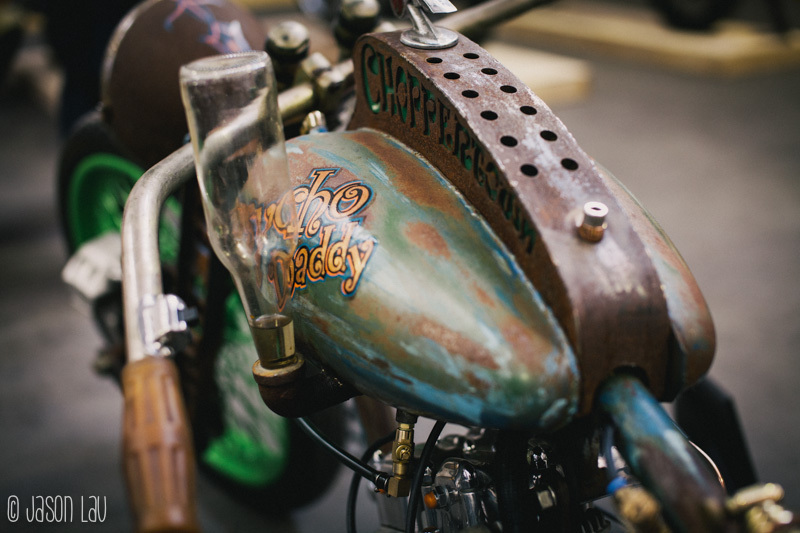 Final details were finished off by Jimmy and the gorgeous flake paintwork was supplied by Thom Armstrong from Rusty Kustoms Paint Department. 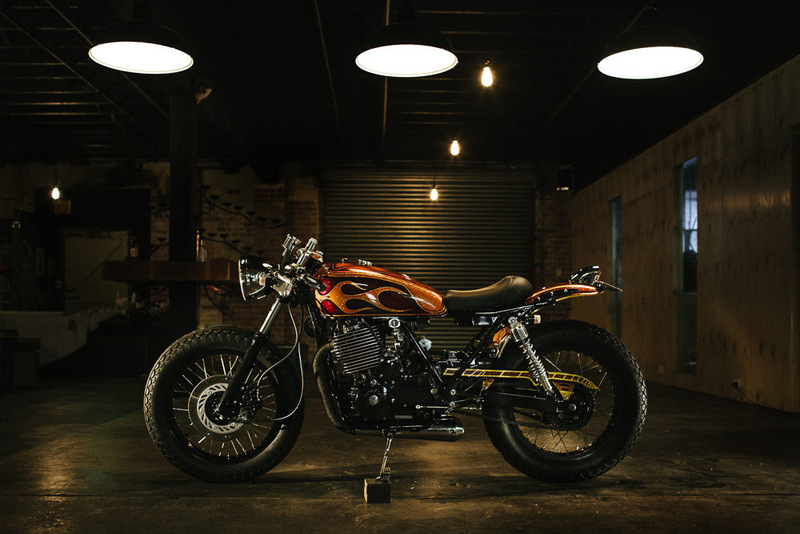 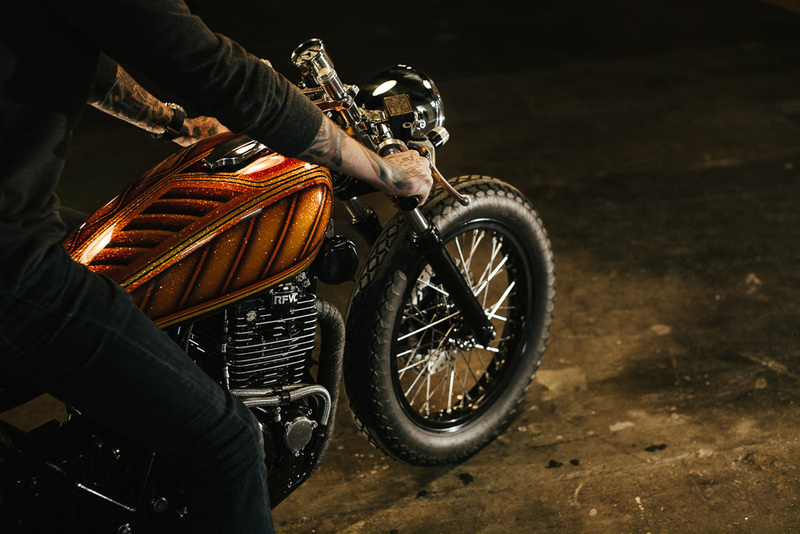 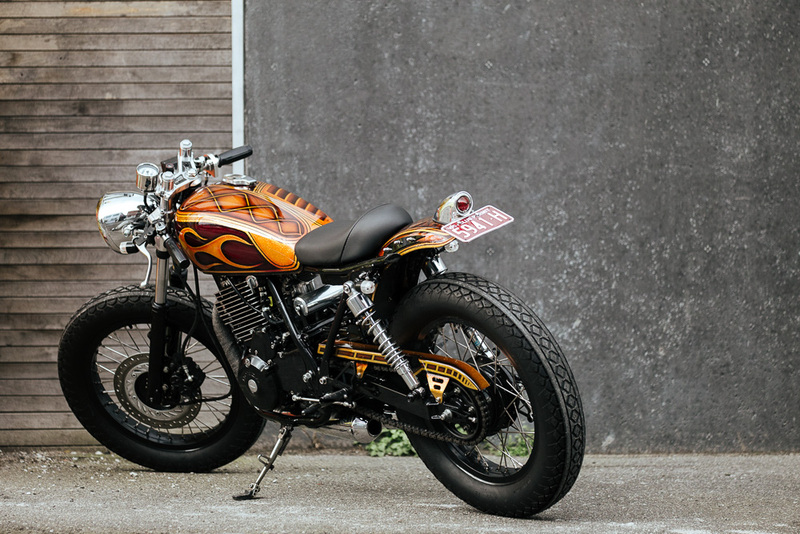 I photographed this bike on location at Kustom Kommune to show off it’s warm tones and because the bike totally matches the raw sprit of the space. 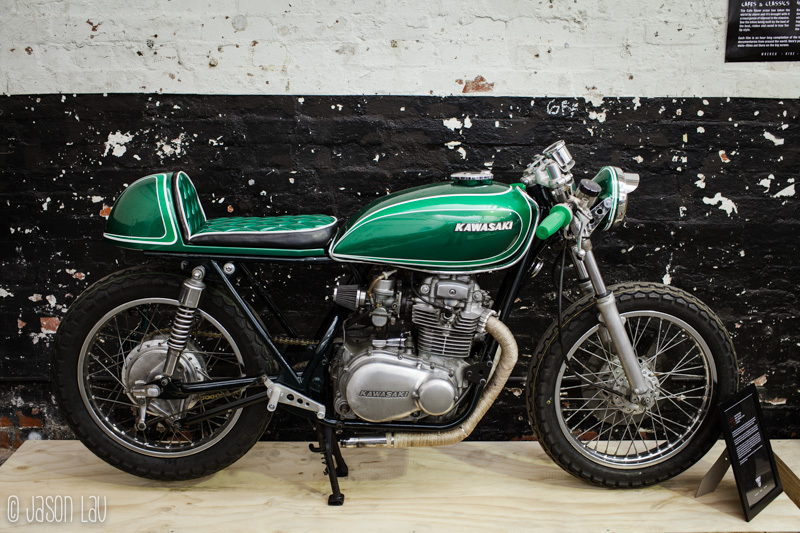 Worth noting that Jimmy is now looking at selling this bike to continue funding for the community garage space. 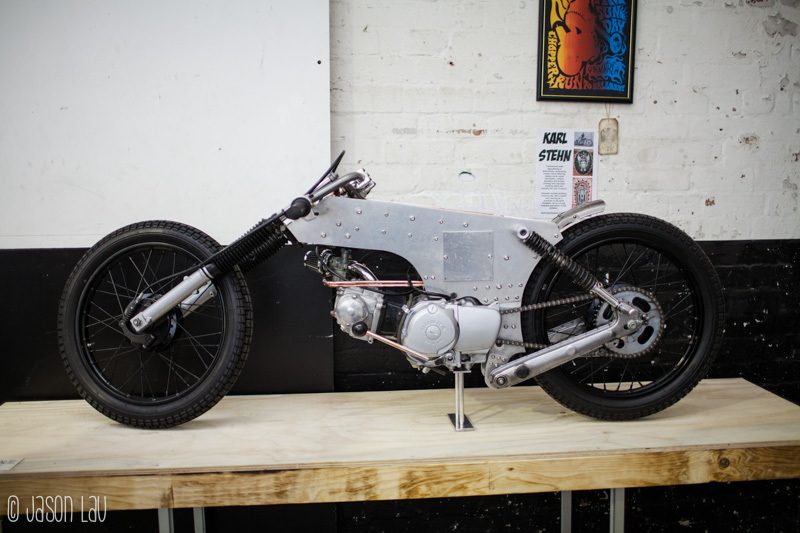 A worthy cause but it will be sad to see this bike go. 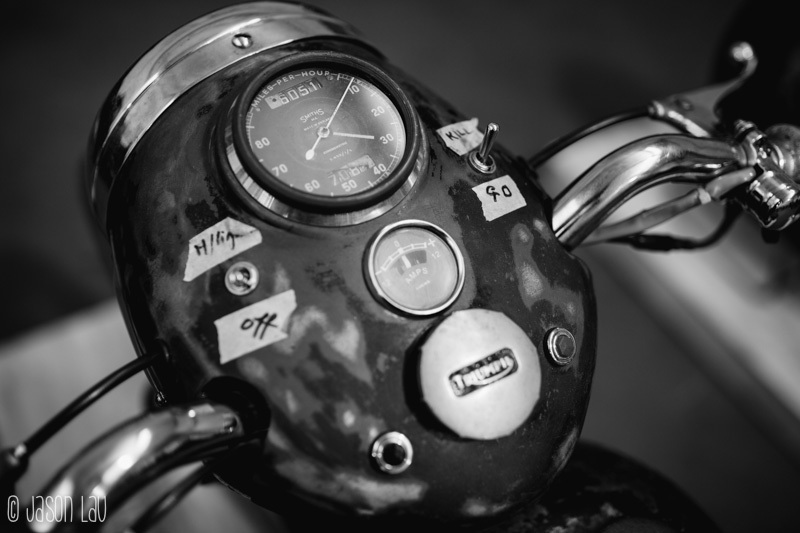 You can read more about the build detals at ROCR blog and see more of my photography work here. 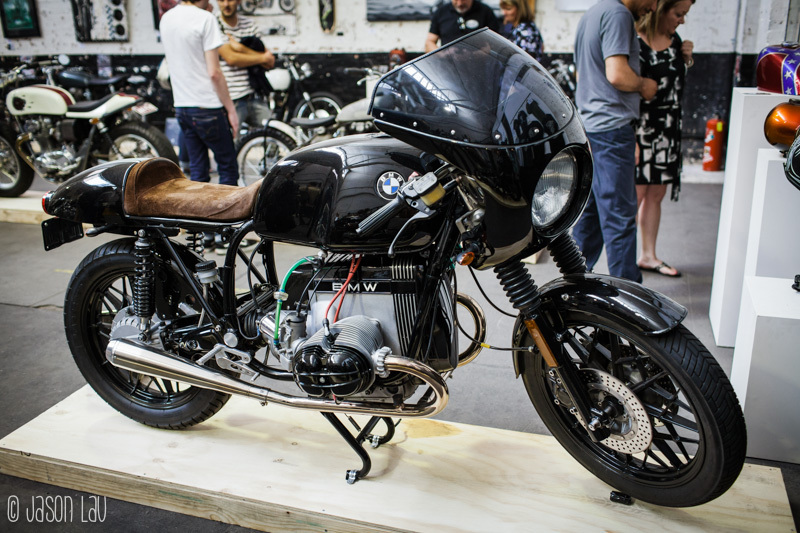 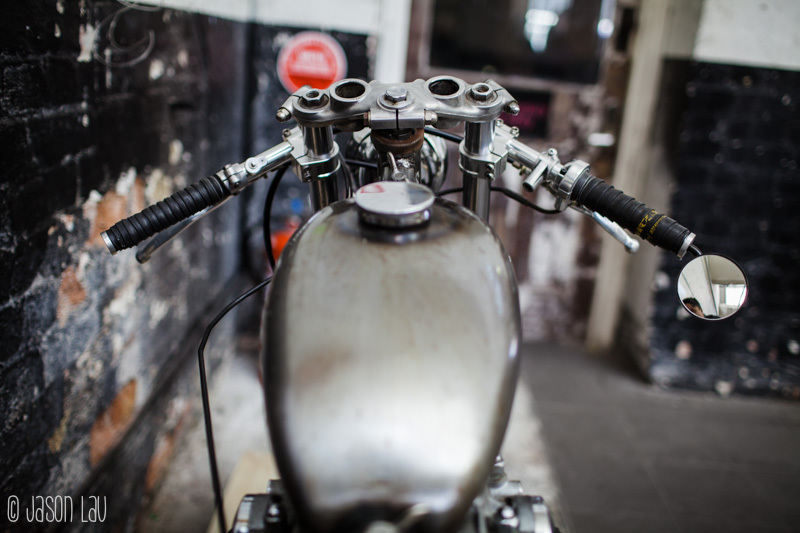 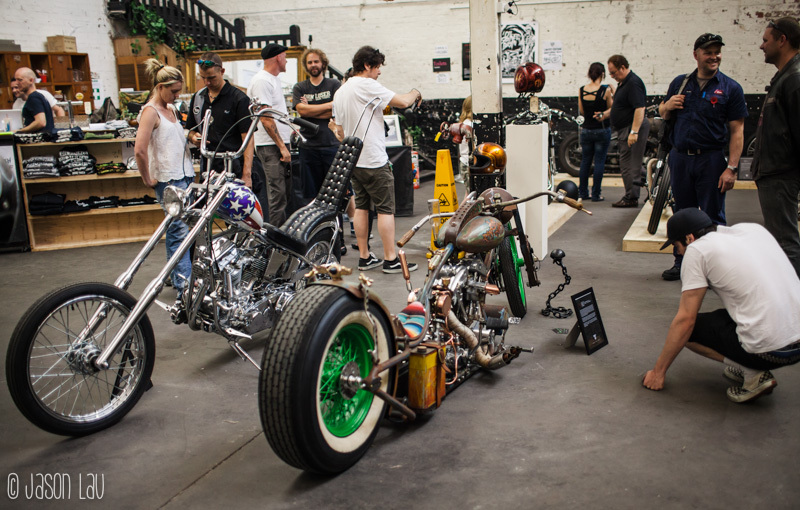 I had the pleasure of attending a Melbourne custom bike show organised by a group called “Oil Stained Brain” at the 1000 Pound Bend Gallery. 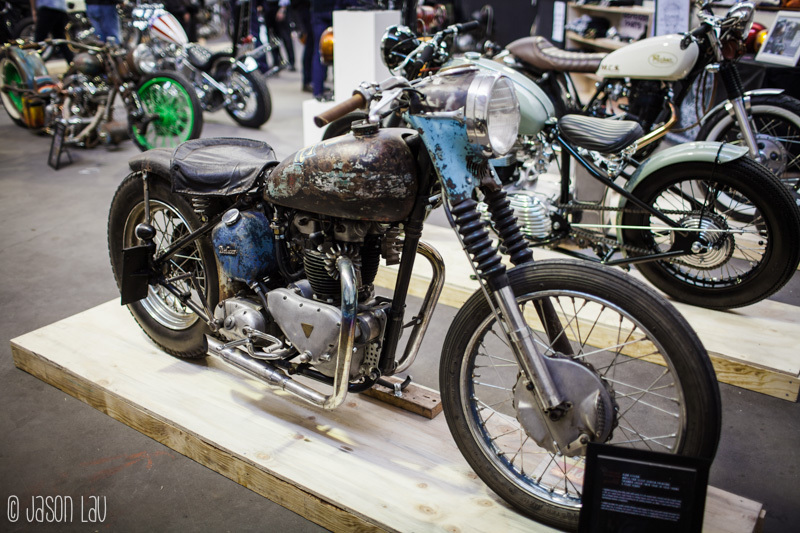 The organisers are Jimmy Goode who runs Kustom Deluxe and Geoff Baldwin, of Return of the Café Racers. 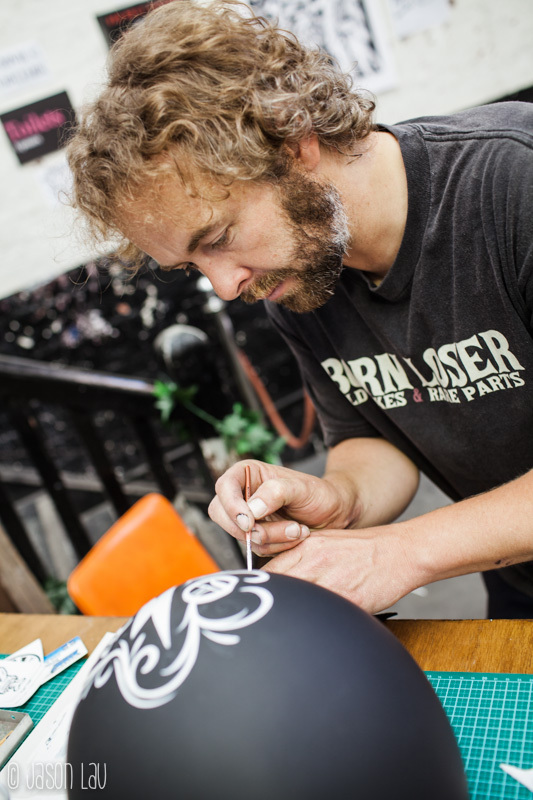 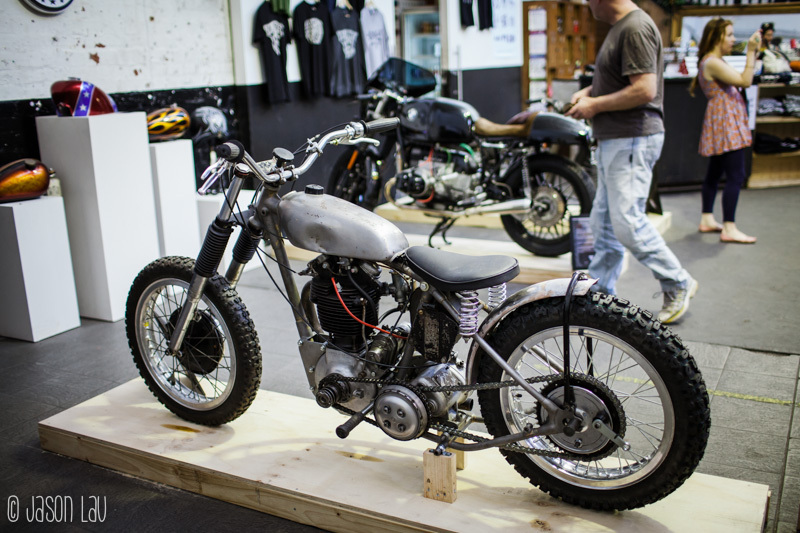 Both guys are deeply passionate about the custom bike industry and feature a wide range of interesting work by independent builders. 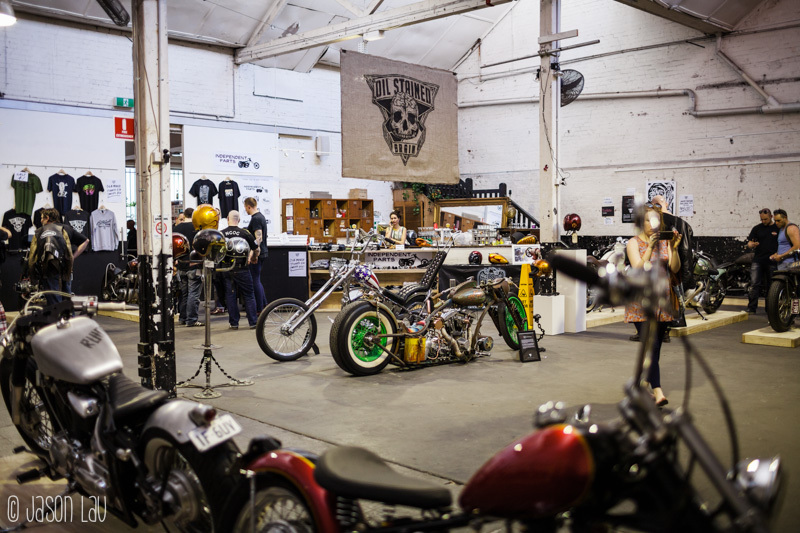 The show was a well populated by black leather clad bikers, rockers and guys with very neat hair. 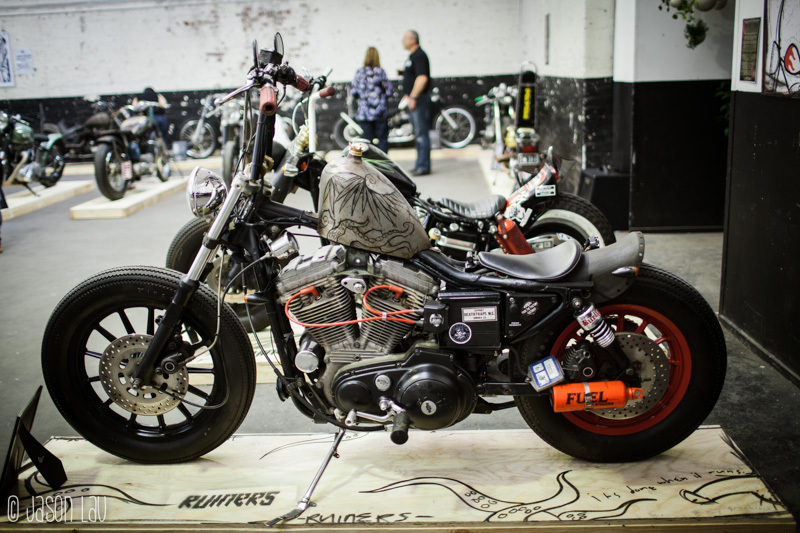 It was the first of hopefully many shows featuring builds from local and interstate bike builders. 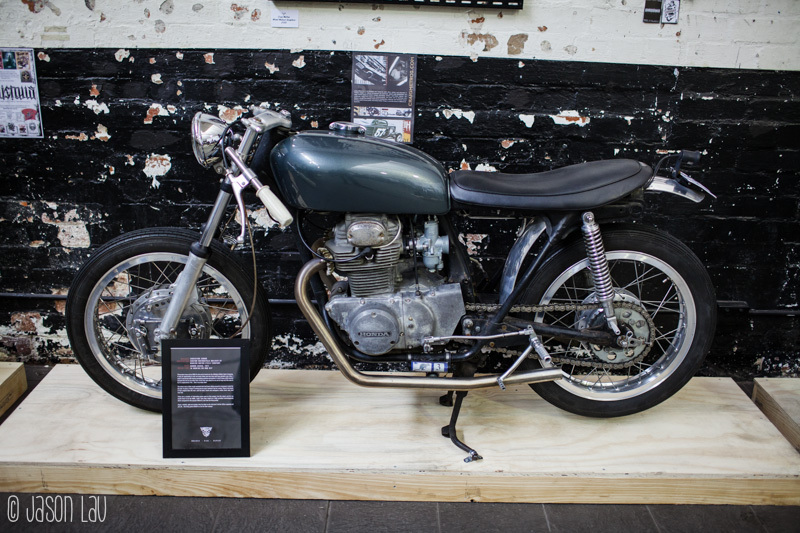 It also features films and artworks on bike culture as well. 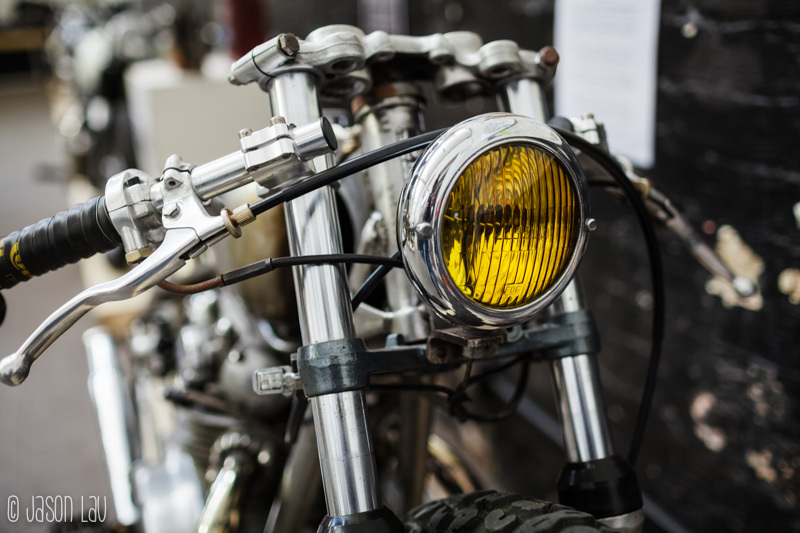 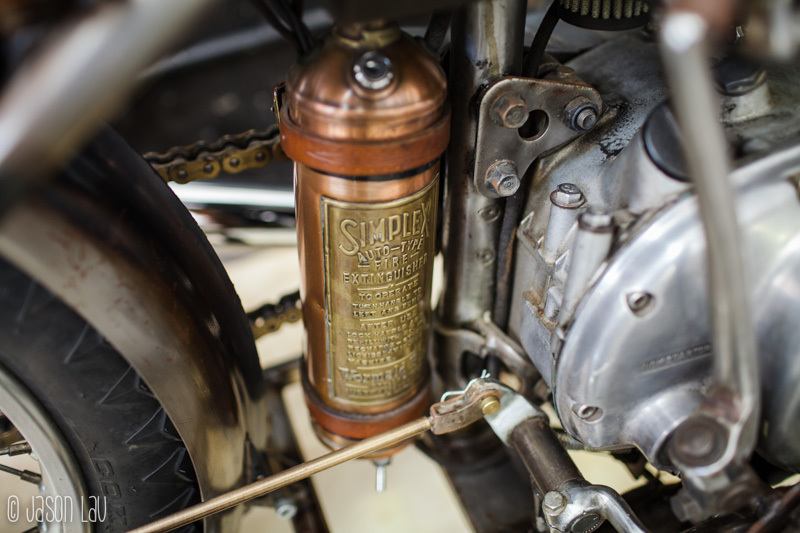 Some highlights include a very steampunk styled 1974 Shovel head with a pneumatic front suspension and a glass bottle fuel gauge, a beautifully restored BMW R1000RS with just the right amount of modern bits, and an iron clad 2008 KTM 250 EXC-F. 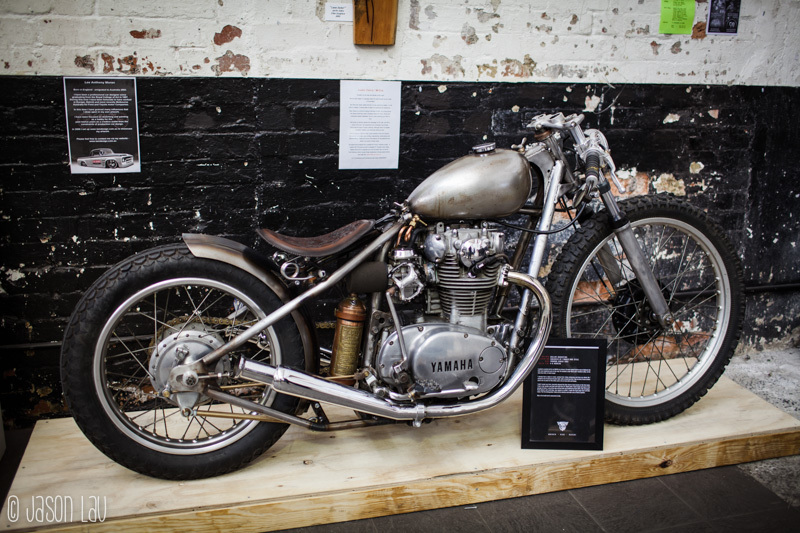 It was an impressive exhibition considering the small but strong subculture of custom motorcycle riders in Australia. 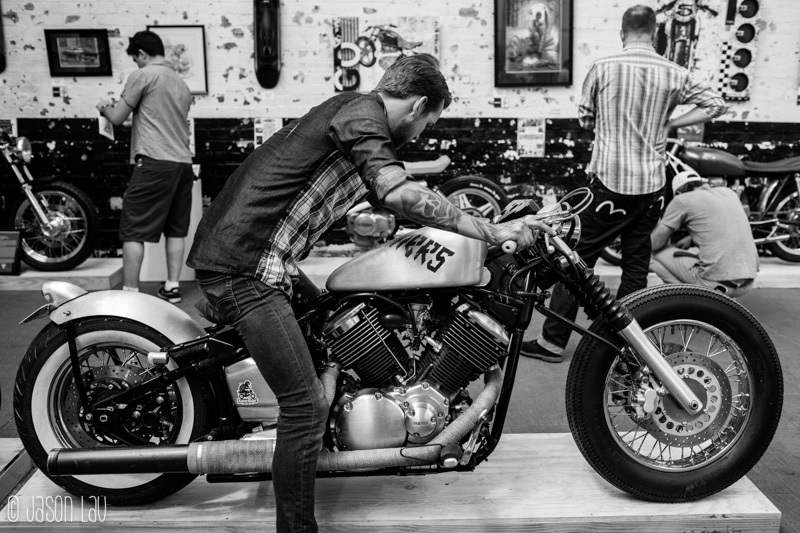 To be honest, some of the patrons rode up on some pretty sweet machines as well. 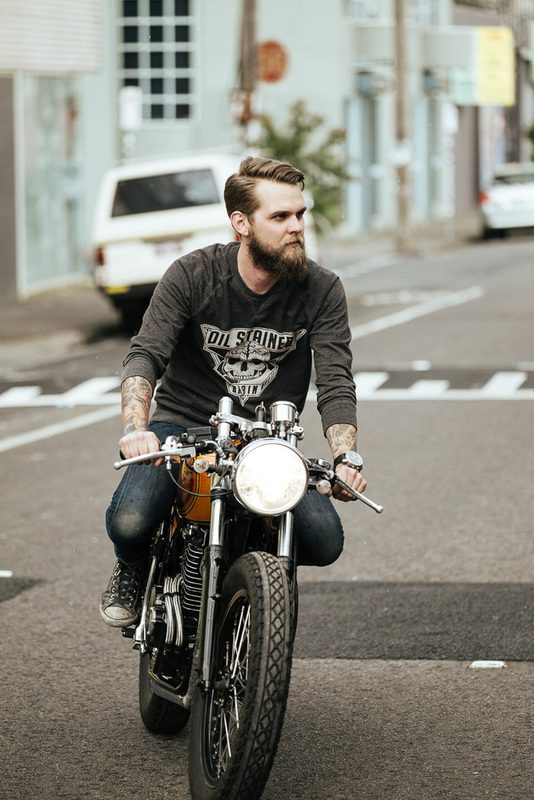 It was a proud day to be a motorcyclist and I hope to see many more events put on by the passionate folks of Oil Stained Brain.